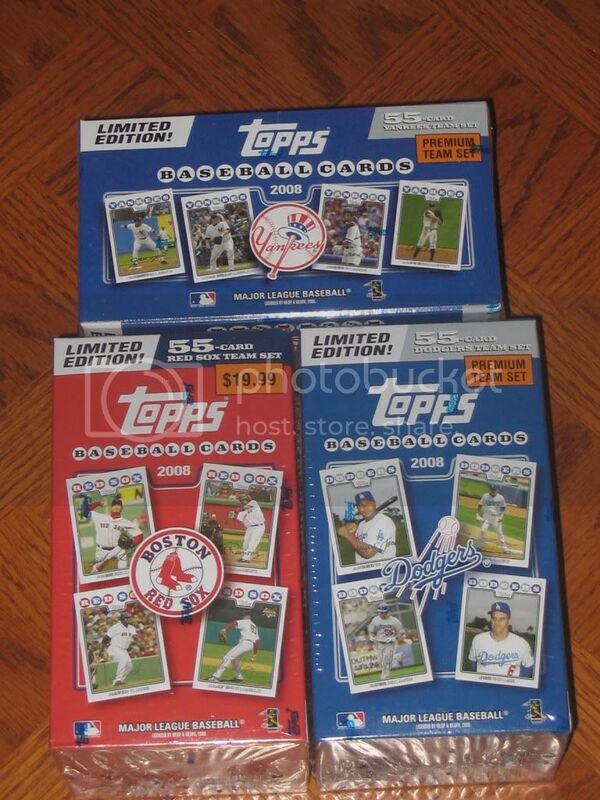 To go along with their 2008 base set, Topps produced six, limited edition 55 card team gift sets for some of the more marketable teams. Each 55 card set includes a card for each player on the entire 25-man roster, classic combos cards, 2007 highlights & team leaders cards, and a stadium card. 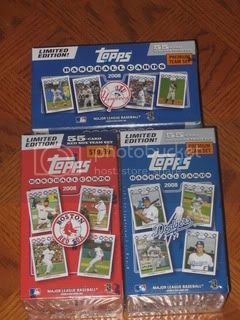 I was able to pick up the Boston Red Sox, Los Angeles Dodgers, New York Mets, and New York Yankees for a great price. Nothing too exciting with the various highlights & leaders cards but the individual player cards are pretty cool because they feature a different picture than the regular issues. The stadium card is by far my favorite. I'm planning on sending these off as TTM requests to an all-time great player from each team. I pretty much have the Red Sox and Dodgers decided but am looking for suggestions for the Mets and Yankees. Any ideas? Another nice success. 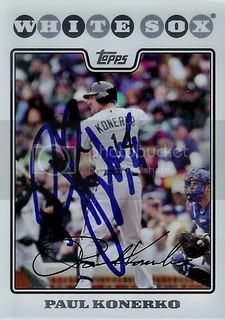 Former Chaparral High School star and current Chicago White Sox first baseman, Paul Konerko signed a card for our set. 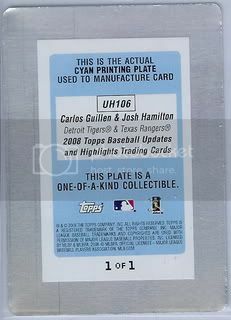 Here's another early Christmas present... Josh Hamilton / Carlos Guillen classic combos cyan printing plate from the 2008 Topps Updates & Highlights set. 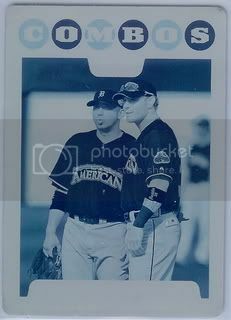 I've been wanting to get an 08 Topps printing plate of some kind to go along with our collection. Josh Hamilton is one of our favorite players so there was no way I could pass this one up. 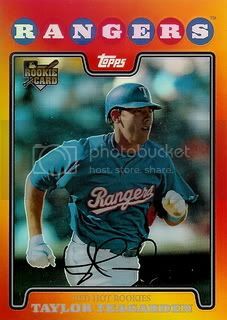 The last Red Hot Rookies card we got is of Taylor Teagarden. I saw Taylor play a few games during the Arizona Fall League and am looking forward to getting this card signed during Spring Training. 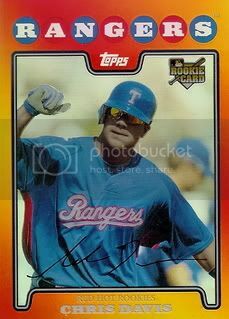 With the injury to Jarrold Saltalamachia it looks like he will have a good shot at being the Rangers starting catcher in 2010. Best of luck, Taylor! Each time I've met him, Gio Gonzalez has gone out of his way to be fan friendly. He's a great guy and this is a great looking card. All of the Red Hot Rookies are pretty cool cards. Basically they are just a Refractor with an redish-orange border. The scans look okay but they are great when you hold one in your hand. The four Red Hot Rookies cards I bought are all players that I should see during Spring Training next year. 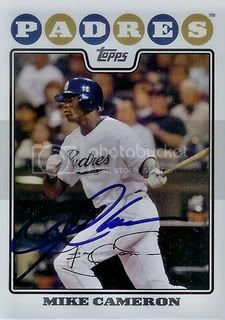 So hopefully there will be an update to these posts showing an autographed version of the same cards. 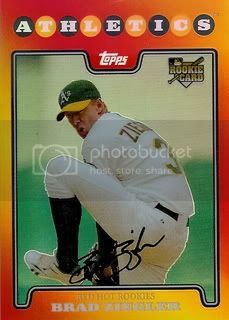 I've heard Brad Ziegler collects baseball cards. I wonder if he has this one? One of the inserts from series 2 of the 2008 Topps set were the Red Hot Rookies redemption cards. While I didn't buy enough packs to pull any of these, I was easily able to go to my favorite baseball card shop ( eBay ) and pick up a few of the ones I wanted at a great price. We'll just call these an early Christmas present to myself. I'm really hoping Chris Davis returns to the form he showed in 2008. It sounds like the Rangers might be shopping for a DH / First baseman but I hope they give him another chance and that he is able to make the most of it. Another nice offseason request came back today. 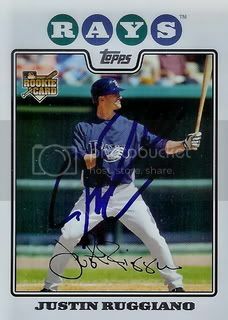 Former Chicago Cubs pitcher, Jon Lieber signed a card for our set. 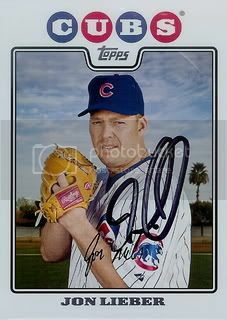 I really liked Jon Lieber during his first stint with the Cubbies. His 21 wins in 2001 probably had a lot to do with that. Back in October & November, my son and I went to a few Arizona Fall League games. 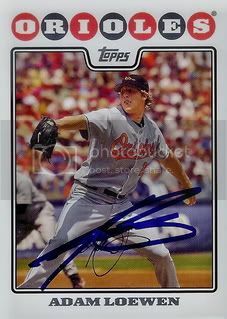 Former Baltimore Orioles pitcher, Adam Loewen is now with the Toronto Blue Jays organization and is trying to make his way back to the big leagues as a position player in. 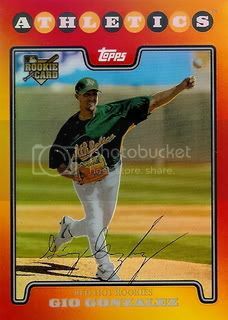 Adam grasciously signed his card from the 08 Topps set for us before a Phoenix Desert Dogs game. Our Mike Cameron success from yesterday was even better because Mike has two cards in the 08 Topps set. Always a great guy, Mike signed his U&H card for us as well. Thanks, Mike! Good luck in Boston! Got a great offseason request back today. 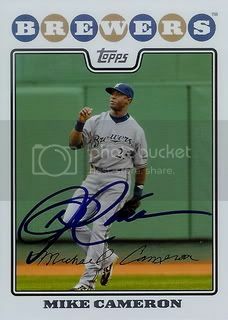 The newest Boston Red Sox outfielder, Mike Cameron signed his card from Series One of the 2008 Topps set. When I purchased my two 2008 Topps factory sets back in March, each one came with a ten card "bonus pack" of ten rookies. There are twenty cards in the set and they look exactly like the regular issued Topps cards but feature a different player picture. Unfortunately both of my packs were the same so I only have half of this set. Back in June I was able to get Justin Ruggiano's regular card signed and recently I was able to add the "bonus pack" rookie version to our collection. These kind of go along with the World Baseball Classic insert set. Very nice to have but don't count toward the official total. I'm still trying to catch up on some of the stuff I received around the end of the regular season. 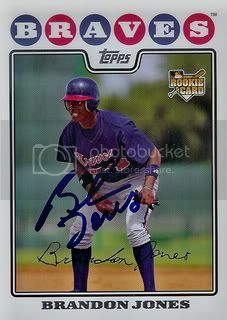 I got the Brandon Jones card below in a 50/50 from a friend on SportsGraphing.com who got it signed at a Gwinnett Braves game. 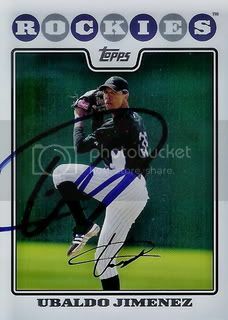 A 50/50 with a member on SportsGraphing.com yielded a signed card from Colorado Rockies pitcher, Ubaldo Jimenez. Another great TTM success. 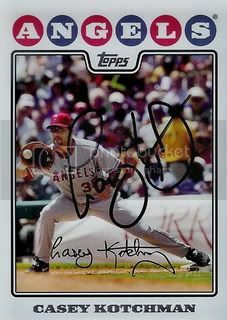 Casey Kotchman signed a card for our set. This was sent around the beginning of the season c/o the Braves. 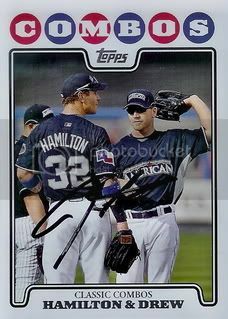 Everyone's favorite Texas Ranger, Josh Hamilton signed a card through the mail for us. Josh has five cards in the 2008 Topps set so it's good to have the first one out of the way. This is the first "Classic Combos" card we have been able to get signed. Hopefully I'll come accross J.D. Drew sometime and be able to have him sign it as well. 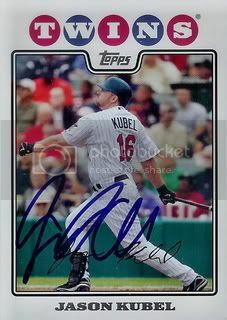 The second card I bought from a friend on SportsGraphing.com was of Minnesota Twins rising star, Jason Kubel. Picked up two cards recently in exchange for a little bit of Paypal from a friend on SportsGraphing.com. 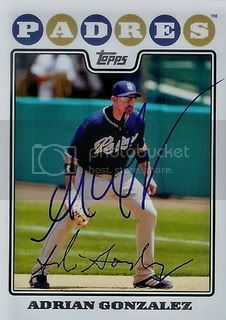 The first card is of San Diego Padres first baseman, Adrian Gonzalez. I usually see the Padres a few times each year during Spring Training but Adrian has always been tough. Since he has 3 cards in the 2008 Topps set, I didn't mind spending a few dollars on this one. Another success that came back over a month ago. 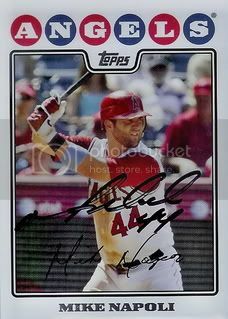 Angels cather, Mike Napoli signed the card below.